It has been estimated by scientists, that there are 600,000 deaths annually worldwide as a result of this fungus. Aspergillus is a genus of fungi (molds) that is one of the most common and deadly organisms in existence. There are over a few hundred species that can be found both outdoors and indoors all throughout the world. But only a few species cause disease, and those same species cause multiple diseases. The spores of Aspergillus can be found everywhere growing upon dead organic matter of the most varied kinds and is spread by microscopic spores which float in the air. Its development is favored by warmth and moisture, and its spores are often found in enormous numbers in water damaged buildings. The spores can also be found in water, growing on crops and the food we eat. Some of the most dangerous molds of this group are Aspergillus fumigatus and Aspergillus terreus which have been identified by scientists as the most dangerous pathogens in humans. (1) A pathogen is an agent that causes infection or disease. The American Academy of Allergy, Asthma & Immunology says that the most common allergy and asthma-causing molds include Alternaria, Aspergillus, Cladosporium, and Penicillium. A recent study published in The Lancet Infectious Diseases by Radboud university medical center/CWZ and Wageningen University & Research had shown that Aspergillus fumigatus is capable of rapid genetic adaptation in both natural environments and in humans. Science Daily reports that the researchers found that any change in the methods used to treat a fungal infection can stimulate the fungus to adapt. This applies equally to starting a new treatment, substituting one antifungal medication for another, or entirely stopping treatment. For example, treating the fungus with medication could lead to drug resistance, but not treating the fungus or discontinuing the initial treatment makes it easier for the fungus to settle in the lungs. The symptoms include fever, cough, chest pain, or breathlessness, which also occur in many other illnesses such as tuberculosis or chronic obstructive pulmonary disease (COPD), but with otherwise healthy immune systems. Most commonly, aspergillosis occurs in the form of chronic pulmonary aspergillosis (CPA), aspergilloma or allergic bronchopulmonary aspergillosis (ABPA). Some forms are intertwined; for example, ABPA and simple aspergilloma can progress to CPA. In humans, Aspergillus is found in the mucus of the nasal cavity, in the fluid of the mouth, the lungs, blood and organs such as the brain and heart of infected victims, which as in most substances exposed to air is subjected to putrefaction. Putrefaction is defined as the decomposition of proteins and the eventual breakdown of the cohesiveness between tissues and the liquefaction of most organs. This is caused by the decomposition of organic matter by bacterial or fungal digestion, which creates the release of gases that infiltrate the body’s tissues and leads to the deterioration of the tissues and organs. Pulmonary aspergilloma is caused by colonization and proliferation of Aspergillus in the lungs. The fungus mixes with mucus and cellular debris within the lungs to form a aspergilloma or fungal ball. It is caused by the inhalation of the Aspergillus fungal spores. The symptoms include an excess mucus, a cough, coughing up fungal balls, chest pain, sputum, hemosputum, hemoptysis or fever. Other, non-invasive manifestations include fungal sinusitis (both allergic in nature and with established fungal balls), otomycosis (ear infection), keratitis (eye infection) and onychomycosis (nail infection). In most instances, these are less severe, and curable with effective antifungal treatment. Diagnosis of pulmonary aspergilloma is usually made based on chest X-ray findings, and the Aspergillus precipitin antibody test results (ie, for IgG) are usually positive. Aspergillomas carry a 40% 5 years survival rate, and it is not clear whether antifungal therapy is helpful. Some people with aspergilloma show progressive form, and is defined as aspergillosis or CNPA, chronic necrotizing aspergillosis. Why do we get sick from Aspergillus? It is estimated that most humans inhale thousands of Aspergillus spores daily, but they do not impact on most people’s health due to effective immune responses. We all breathe them in most of the time but most of us have efficient immune systems that kill the spores. However, some people do not manage to kill all of the spores because their immune systems have been weakened due to the mold itself because they have breathed in many more spores than is usual, or by other factors that make people sick such as toxic environments with many types of pollution, multiple infections, transplant patients, bone marrow transplant recipients, and sometimes because they are genetically susceptible (e.g. some asthma sufferers). Apsergillus release spores that also produce toxic secondary metabolites that are called mycotoxins. Myco means fungal, and many molds are known to have toxic fungal metabolites that poison humans, animals and plants. As mold “consumes” it’s food (organic matter such as humans), the chemical reactions of enzymes, substrates and mold growth produce carbon dioxide, water, and volatile organic compounds. Cells are then deprived of oxygen (O2), so carbon dioxide (CO2) in the blood increases, pH decreases, and the toxic waste accumulates in the blood, tissues and organs. This also happens in our homes and buildings as the mold consumes the structure and releases toxins and gasses in the air. In an environment where there is a lot of carbon dioxide in comparison to oxygen, the CO2 tends to displace any O2 attached to hemoglobin and vice versa. This means that the most important gas, oxygen at that point is transported at the expense of the less important gas, carbon dioxide. This is what toxic mold does to the human body. It literally breaks down the body, blood, and organs with poisons and gasses such as carbon dioxide that turns to carbonic acid as it eats the person from inside while they are still living. The toxins and gasses are released by the mold spores to further poison and putrefy the person causing them to become ill, and diseased. A process that makes them sick and may eventually lead to their death. Mycotoxins have several adverse effects on human beings, crops and animals that result in both economic losses and illnesses. Diseases caused by exposure to mycotoxins are known as mycotoxicoses. Acute mycotoxicoses can cause serious and sometimes fatal diseases. Aspergillus produces aflatoxins that are associated with both toxicity and carcinogenicity in human and animal populations. The diseases caused by aflatoxin consumption are loosely called aflatoxicoses. Acute aflatoxicosis results in death; chronic aflatoxicosis results in cancer, immune suppression, and other “slow” pathological conditions. Apsergillus has four major aflatoxins, B1, B2, G1, and G2 (based on their fluorescence under UV light (blue or green) and relative chromatographic mobility during thin-layer chromatography) M1 and M2(produced in milk and dairy products) (Fig. 1) (D’Mello and MacDonald, 1997). Aflatoxin B1 is the most potent natural carcinogen known and is usually the major aflatoxin produced by toxigenic strains (Squire, 1981). The liver is the primary target organ, with liver damage occurring when poultry, fish, rodents, and nonhuman primates are fed aflatoxin B1. (2) Aflatoxins are difuranocoumarin derivatives produced by a polyketide pathway by many strains of A. flavus and A. parasiticus; in particular, A. flavus is a common contaminant in agriculture. 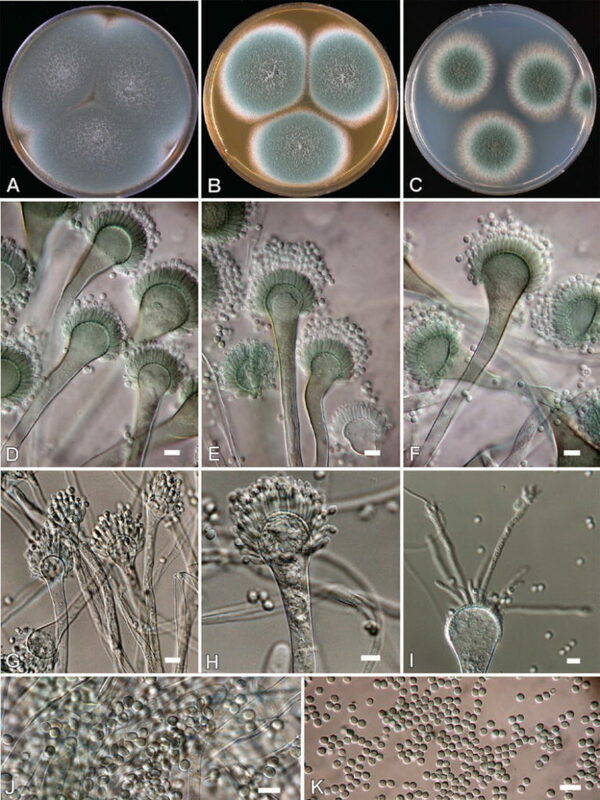 Aspergillus bombycis, Aspergillus ochraceoroseus, Aspergillus nomius, and Aspergillus pseudotamari are also aflatoxin-producing species, but they are encountered less frequently ( Peterson et al., 2001). Aflatoxins are poisonous and cancer-causing chemicals. They can be inhaled, ingested, but the most toxic type of aflatoxin, B1, can permeate through the skin. Children are particularly at risk from aflatoxin exposure, which leads to stunted growth, delayed development, liver damage, and liver cancer. Adults have a higher tolerance to exposure, but are also at risk. This mold along with its Aflatoxins and the gasses it produces can penetrate deeply into the lungs, sinuses and tissues of the body, causing inflammation and swelling, which obstructs the respiration. At the same time, it produces poisons such as carbon dioxide and oxalic acid that break down the body to cause putrefaction of the blood and organs. Invasive infections due to Aspergillus spp. and other hyaline and dematiaceous fungi have emerged as prominent causes of morbidity and mortality worldwide. Taken together, the major chronic, invasive and allergic forms of aspergillosis account for around 600,000 deaths annually worldwide. The name Aspergillus is derived from the Latin aspergillum, which is the hand held device that is used by a Catholic priest at mass to sprinkle holy water on the faithful. In ancient times, Holy Water was a special anitfungal mixture that the priests had used to treat and cure people during the plague which many authors and experts, including myself, believe was caused by mold. This device is made to look like the mold Aspergillus with a circle or globe (called the vesicle) that is attached to a handle with spikes or holes around the outside. Nierman, W. C. et al. (2005) Genomic sequence of the pathogenic and allergenic filamentous fungus Aspergillus fumigatus. Nature 438, 1151-1156. Aspergillus fumigatus. A-C. Colonies 7 d 25 °C. A. CYA. B. MEA. C. CYA 37 °C. after 3 d. D-I. Conidiophores. D-F. A. fumigatus. G-H. A. fumigatus var. ellipticus. I. Atypical conidiophore of CBS 133.61. J. Conidia of A. fumigatus var. ellipticus. K. Conidia of A. fumigatus. Scale bars = 10 μm. Yes, but not all. There are a few out there that get it. Not many but a few. Thanks for your comment and kind criticism. OK, I will do so in the future.